VANCOUVER - B.C. Lions quarterback Travis Lulay has elected to forgo surgery and will continue to rehabilitate his right throwing shoulder as he aims for a late-season return to the lineup. Lulay suffered a shoulder dislocation in a Sept. 5 game against Ottawa and was later placed on the club's six-game injured list. "I have considered all options with our team doctors, physiotherapists and training staff and at this point, I am very encouraged with my rehabilitation to date," Lulay said Tuesday in a release. "Having been in this position last year, I am cautiously optimistic that I can return to action before the end of the regular season." Lulay dislocated the same shoulder a year ago but returned to action in the final week of the regular season. He was the Lions' starting quarterback in the Western semifinal. 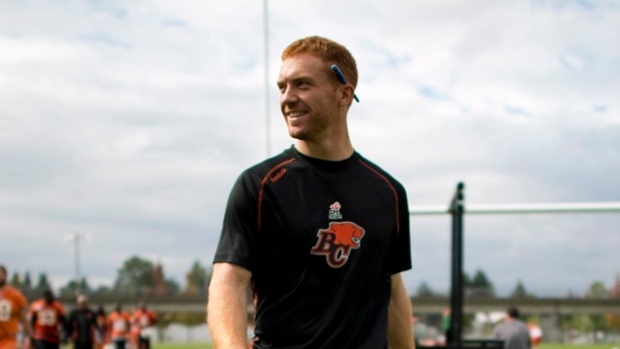 Following the 2013 season, Lulay elected to have surgery to increase the stability of the shoulder. The latest dislocation put him on a similar rehabilitation timetable as the original injury last year. "We believe Travis will be able to return to action in coming weeks," said general manager Wally Buono. "At this time, he is set to come off the six-game injured list with two regular-season games remaining on our schedule, with a bye week in mid-October also providing some additional recovery time." Also Tuesday, the Lions signed wide receiver Lavasier Tuinei, defensive back Brandon Jones, running back Bradley Randle and wide receiver Derek Yachison to their practice roster. B.C. also released defensive tackle Brandon Jordan, who was later signed by the Calgary Stampeders.